In this modern day and age, it is surprising that managerialist perspectives, practices and ideas are colonising the study of sexualities in organisation. 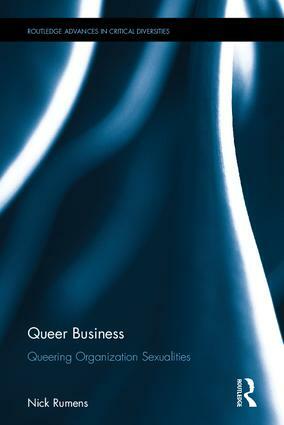 A timely intervention into the contemporary vitality of queer theories, Queer Business is an innovative book length exploration of how queer theory has been used in management and organisation studies, with the aim of broadening and deepening queer scholarship in this discipline. Through both scholarly and original empirical research, Rumens also seeks to demonstrate how queer theory has been mobilised in MOS and how it might be advanced in a field where it has yet to become exhausted and clichéd. In particular, this volume shows how scholars can use queer theory concepts to explore how lesbian, gay, bisexual and transgender sexualities and genders are understood and experienced in the workplace. Challenging notions of LGBT+ inclusivity in the workplace through concepts such as queer liberalism and homonormativity, Queer Business will appeal to scholars, undergraduate and postgraduate students and postdoctoral researchers interested in fields such as management and organisation studies, queer studies, gender studies, sexuality studies, organisational theory and cultural studies. A first of its kind, this vital volume offers a comprehensive and insightful tour of timely concerns provoked by the uneasy meeting of queer theory and management studies. It powerfully demonstrates how queering can unsettle the constitutive gender and sexuality of organizing to promising effect. This is a must-read companion for any treatment of power in contemporary organizational life, and especially for courses addressed to critical management studies or other radical theories of work and organization. Chapter 7: The Future is Queer? Nick Rumens is Professor in Human Resource Management at University of Portsmouth, UK.